The first recorded breach of France’s new law banning the wearing of the niqab and burka in public has resulted in a 28-year-old woman being fined 150 euros on Monday. 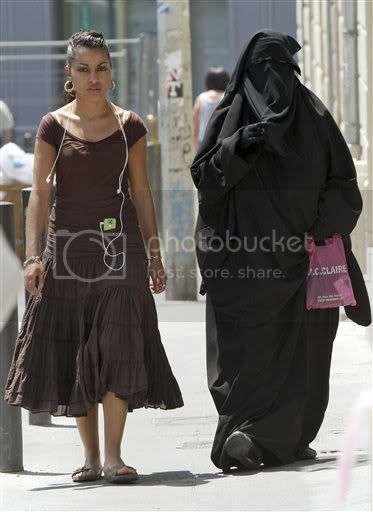 She was wearing an Islamic face veil outside a shopping centre in Les Mureaux, northwest of Paris. Also on Monday, the first day of the ban, several people, including two veiled women (see WVoN story), were arrested in Paris for ‘holding an unauthorised protest’ against the new law. A woman wearing a niqab and accompanied by a television crew, was stopped by police on Tuesday at a town hall in Saint-Denis, a northern suburb of Paris. After being taken to a police station, she removed her veil, stating that nobody had forced her to wear it. She was released without fine. Under the new law, anyone forcing a woman to wear a full-face veil could receive a one-year jail sentence and a €30,000 fine. President Nicolas Sarkozy says the law aims to support women’s rights and reaffirm Frances’s secular values.